Casa Lajagua is located in picturesque Pedasi – a quaint coastal town featuring streets lined with tiled colonial-style homes. We are on the Main Street and a 5 minute drive to the beautiful blue waters of Playa Arenal. We provide comfortable accommodations, delicious food, relaxing atmosphere and many fun-filled activities for every type of adventurer. Hola, our names are Craig and April Lewis and in the past we have called B.C. Canada home. In 2007 we decided to free ourselves from the corporate world and enjoy a more relaxed lifestyle. We traded our leather shoes for flip flops and began traveling and working for several years managing dive/watersport and resort operations. We first visited Panama in 2010 while employed as dive and watersport instructors on a luxury cruise ship. We had a great feeling about the country and returned several times. Jumping ahead to 2013, we were running a dive/resort operation for a lodge in Fiji when we spotted the opportunity for Casa Lajagua online. 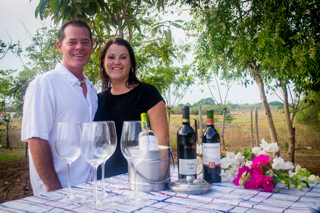 As they say, the rest is history, and in early November 2013 we became the proud new owners of Casa Lajagua. We are delighted to welcome you to our own very unique hotel, where you come as guests and leave as friends. 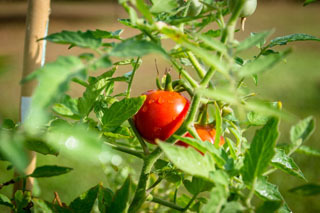 Here at Casa Lajagua we grow many of our own fresh fruit and vegetables from our beautifully landscaped yard. We have many fruit trees including Mango, Papaya, Avocado, Passion Fruit, Guava, Orange, Banana, Star Fruit and others. A stroll through the grounds will also reveal raised organic gardens producing many of the vegetables that we will serve you during your stay. The common area is a gorgeous open lounging retreat where you can sip wine while waiting for a gourmet meal to be served or simply read a book while listening to music. We make sure your stay is formed around your passion and needs. 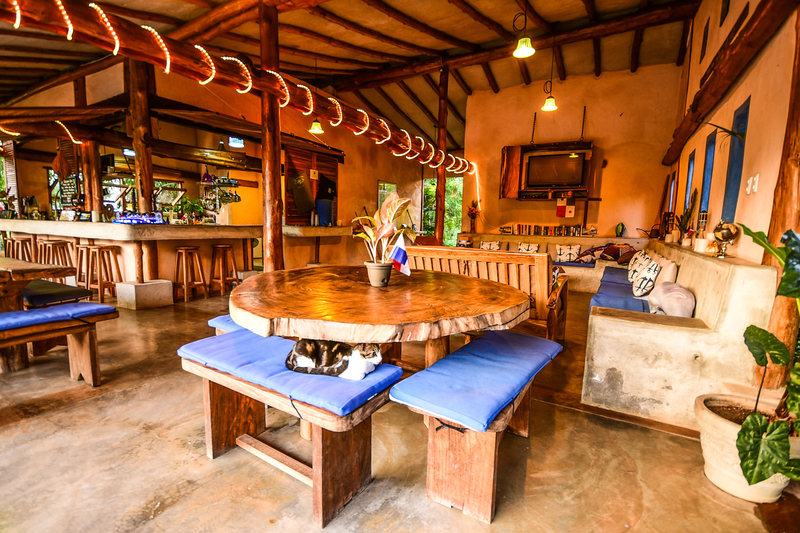 Guests love the unique designs and construction of the concrete and teak buildings, not to mention relaxing in the swimming pool, where we can serve you one of our signature homemade drinks. Our pool is beautifully designed with a small palm tree island in the shallow end that’s great for the kids and the deep end that is exactly 21’8.75” feet from the bar! It is very important to us that you feel safe and relaxed while you are here. While Pedasi, Panama is very safe and friendly our grounds are fenced and gated with security CCTV cameras as well as motion sensing flood lights located on the property and in the covered parking area. Our gates are locked each night by 9PM, however you will have 24 hour access with your room keys. On top of this we are also located directly across the road from the police station. Many of our guests are here to look at a future property or rentals here in Pedasi. If this is something you are interested in please let us know and we can introduce you to great people in the area who will look after your needs.